I always considered this one of Chevy's very best films, one where he does get to show a little of his seldom-seen serious side. Not to mention he's amusing when he's trying to stop the crazed mailman (especially in his "Commando Chase getup with the giant boulder), and when he tries to get the fishhook out of Brad Sullivan's throat and only manages to whack everyone else silly (and then has Sullivan out to get him for the rest of the picture). One of my favorites by far. I don't know what it is about this movie but it really makes me want to move to VT and get a farm with a pond and just relax. I watch this movie a lot and always enjoy it. I absolutely love this one! To me I always like to watch it around Christmas time, even though it technically isn't a Christmas movie. This is what I miss about Chevy Chase, movies like this that he used to do. I wish that he would do something fun like this one again. It has been so long since he has been in anything worth watching. Love it love it love it!! Thanks for mentioning it Chris! Of course it's a Christmas movie. The following Carolers are the funniest part. And then the sheriff's car takes off and knocks down the town Christmas tree. Classic. I personally love the scene when he catches the snake in the pond. Those first few days at the new house are great. Has anyone ever looked to see if you can find the house where this was filmed? I would love to see it if I was in the area ever. Have you looked under the main page and filming locations?? Great movie. Unfortunately there's no entry for this film in the database. Anyone fancy writing a review? I would love to but sadly my writing skills are terrible. It's a lot easier to talk about a film than it is to express it in written terms. I hope someone steps up to the challenge. Anyone have this on Blu-ray? I'm curious how it is and if there are any extras. 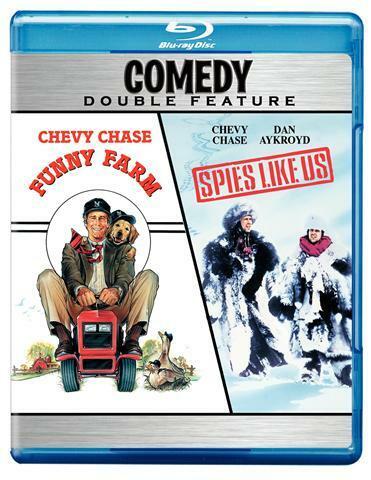 gordon i have the blu ray of funny farm/spies like us,there's no extras on the disc,it's both films on 1 disc. gordon if you can get it cheap enough i'd say go for it,the picture quality is not demo material(so whatever you do don't call your neighbours round to show off your new led tv and then chuck this on you'll be left looking like this - ),but at the same time it's still pretty decent overall,some scenes on funny farm look rather good actually. same goes with spies like us,but i did find with spies many of the earlier scenes seemed rather dark and maybe lacking slightly in detail but found the picture greatly improved as the movie progressed. the audio on both movies is dts hd 2.0 audio, meaning it's a stereo sound mix so no surround activity to talk about but the fact it's lossless(no loss of quality unlike standard dolby digital) audio both movies sound very clear and overall i'd say a big step up over previous releases. gordon i'm not sure the going price for funny farm/spies like us at the moment,but if it's going for what you'd consider a bargain price i'd say grab it with both hands it's well worth it! p.s. gordon if there's any films out on blu ray you like that you would like to know about give us a shout,i can't guarantee that i would have seen it but there's quite a few out there i have . when i get chance i'll put a few suggestions on your blu ray thread. Hey, awesome stuff Young Warrior! I do have both of these movies on regular dvd. I threw in Funny Farm for a min yesterday to check the picture out and it was pretty solid. Got a nice upgrade in picture from the blu-ray player. I think that this is going for 15 or 20 right now. I'm sure if I see it for a good deal I won't be able to turn it down. I really can't put my finger on it but I just love this movie! Rewatched Funny Farm (1988) and while it´s still not in my top 5 Chevy films, it was better than i remembered. I guess i enjoyed the drama part more as an adult or the dry, witty humour just works better now. This was director George Roy Hill´s last film. BTW, isn´t it funny that another out-of-town comedy The Great Outdoors debuted in the same month, June 1988, only two weeks after FF. Need to dig Funny Farm out for another watch but I do remember always enjoying it! I think I'm probably pretty forgiving when it comes to Chevy Chase's movies as I even like most of the ones that are regarded as being stinkers such as Modern Problems,Cops And Robbersons and Deal Of The Century. Got super excited when I saw this thread pop up again. It's almost that time of year for me to watch Funny Farm a couple times. I love this movie during the fall. Beautiful scenery in this film and some good laughs. One of my favorites. "You're not knocking him out, you're only beating the **** out of him!"